Pasta comes in many shapes and sizes; the choice of shape depends on the sauce – which pasta will best hold a particular sauce. Traditionally, pasta is made from semolina flour, which in turn is made from the endosperm of high-protein (hard) durham wheat, the gritty, coarse particles of wheat left over after the finer flour has been extracted. It has a distinctly yellow color. (Cream of Wheat is a type of semolina, but comes from softer wheat varieties). Since semolina contains none of the bran or germ of the wheat, similar to white flour, it does not contain the fiber, vitamins and minerals present in the bran and germ. Instead, it is primarily starch (carbohydrate) and protein. On the other hand, it also does not contain the problematic wheat germ agglutinin (WGA), a lectin implicated in leptin and insulin resistance, and the resultant health issues of obesity, clogged arteries, arthritis, etc.. For more on WGA, see my article on Sprouted Grain & Sprouted Grain Flour (About), which discusses the problem of gluten and lectins in grains. Semolina does contain gluten, however. In fact, it has the highest gluten content of any flour. So is not for those who are sensitive to this protein. 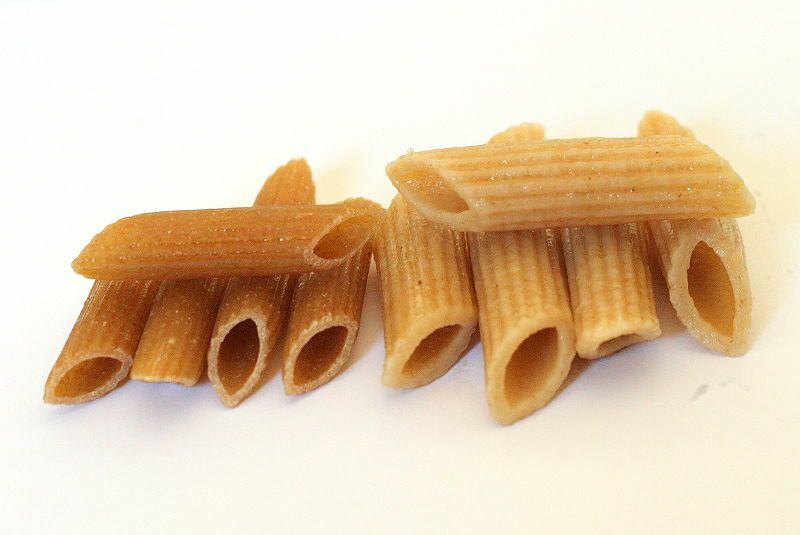 Recently, whole grain pastas have become more popular, but these do contain WGA as well as phytic acid (an anti-nutrient that binds minerals and blocks their absorption). Therefore, I do not recommend whole grain pasta unless the grain has been sprouted or fermented first. As long as you don’t have pasta frequently, regular semolina pasta is probably a good choice unless you have a problem with gluten. But I don’t recommend eating any wheat-containing foods daily. Instead, mix up your grains throughout the week. Spelt, an ancient wheat variety with a different type of gluten (different amino acid profile) than the gluten from wheat, may be less problematic for those with gluten sensitivity. 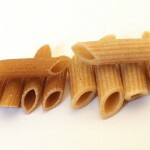 Many pasta shapes are available in spelt. Kamut, another ancient variety of wheat, has the same type of gluten as wheat, but less of it, because it is not hybridized to increase the protein content. Some of wheat’s relatives, such as barley, are less hybridized and have lower gluten content, which you can use to make your own pasta. Oat can be gluten-free (if it has not been contaminated from wheat); I’m not aware of commercial oat pasta, but you can use it to make your own pasta. Quinoa pasta – quinoa is gluten-free, as it is not a true grain. It now comes in several popular shapes. Make your own pasta from sprouted and soaked grain/flour. Make your own potato gnocci, using a non-wheat flour, such as rice or quinoa with the potatoes. This entry was posted in Pasta and tagged pasta. Bookmark the permalink.